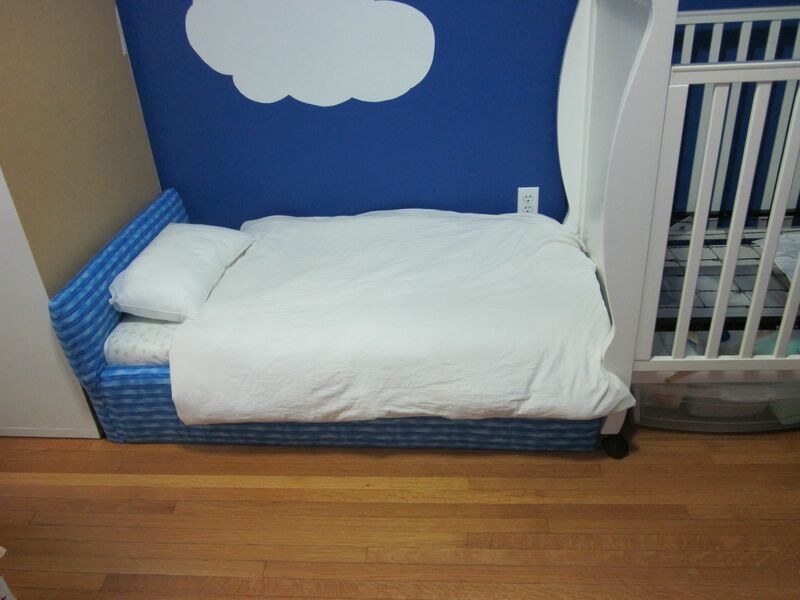 N has a new big-boy bed! Jealous? 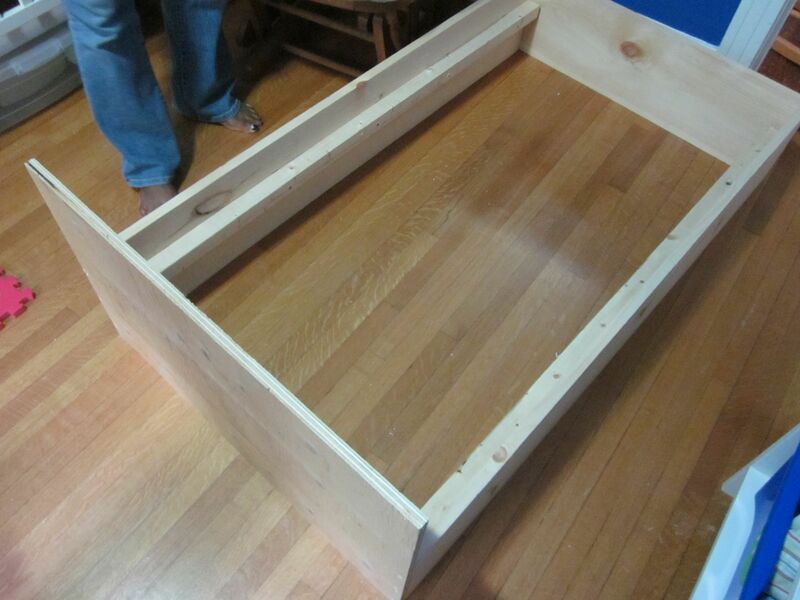 Don’t be – the whole thing took me about 3 hours to build, and I’m going to take you through the process. Ready? 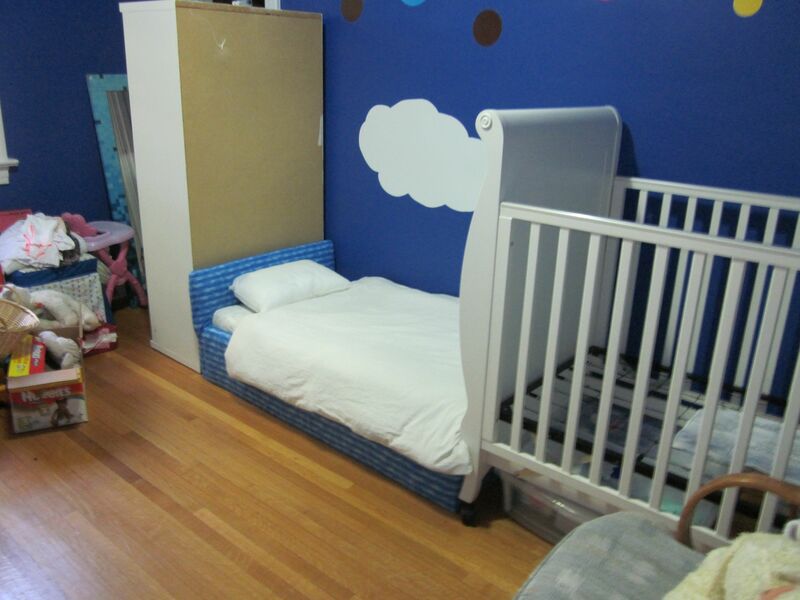 2 – 1 x 10″ boards, 8 feet long. Cut each one into a 52″ length and a 29 3/4″ length. 2 – 2 x 2″ furring strips, 8 feet long. Cut 50″ lengths of each. 3 – 1 x 4″ furring strips, 8 feet long. Cut them into 27″ lengths – you should end up with 9 of them. 1 – small piece of plywood (24 x 48″). Cut a piece 29 3/4″ x 22″. 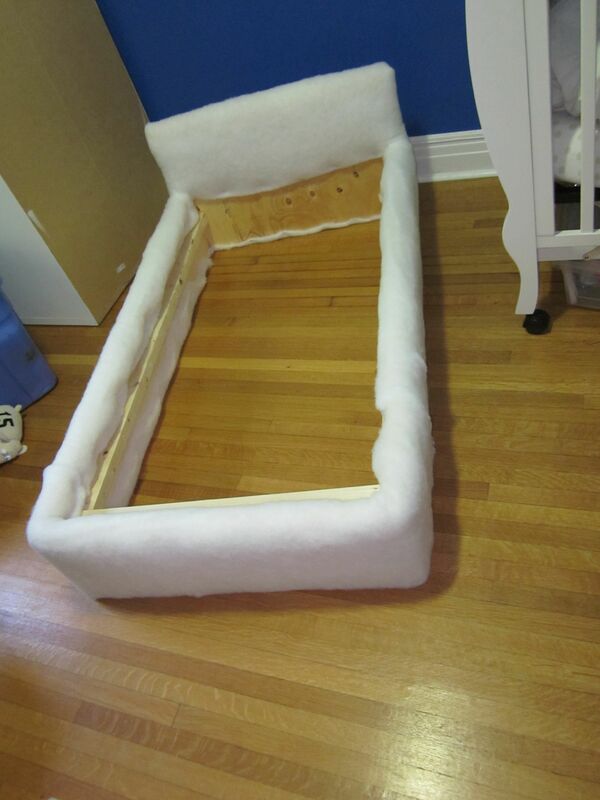 1″ upholstery foam. 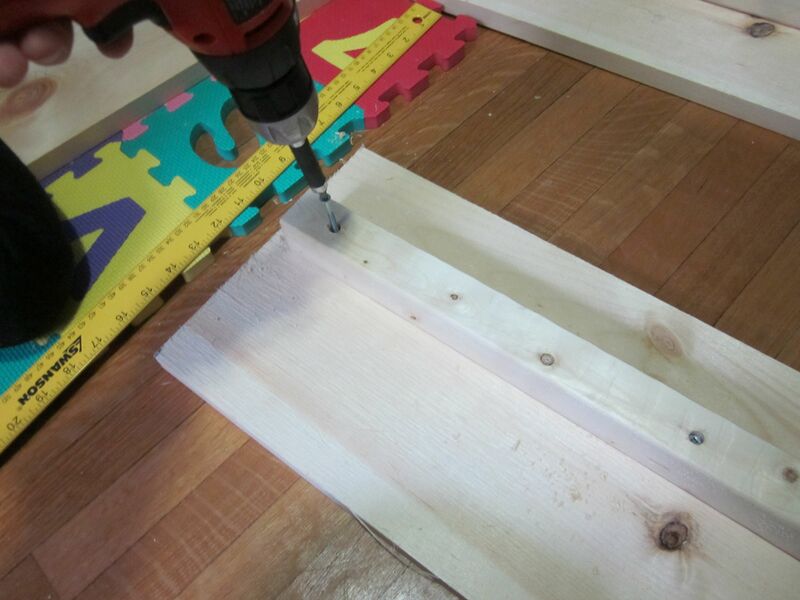 Scraps will do, as long as it’s at least 5″ wide and you have enough to stretch along 200 linear inches or so. Quilt batting. I used one and a half packages of 70″ x 100″. Fabric to cover the bed. You’ll need a strip of 16″ x 135″ (I sewed a few strips together to make a long one) and a 35″ x 38″ piece for the headboard. Screws. I used #8 screws that were 2″ long. Set those two long pieces aside. Repeat with the second long board. First prepare your long strip of fabric. You can either cut an 16″ wide strip out of a really long piece, or you can be cheap like me and sew a few strips together. Staple the end of the fabric to the back of the headboard (so that it’s ready to wrap around the sides). Begin wrapping the fabric around the frame, being careful to stretch it a bit so that it doesn’t end up wrinkly. 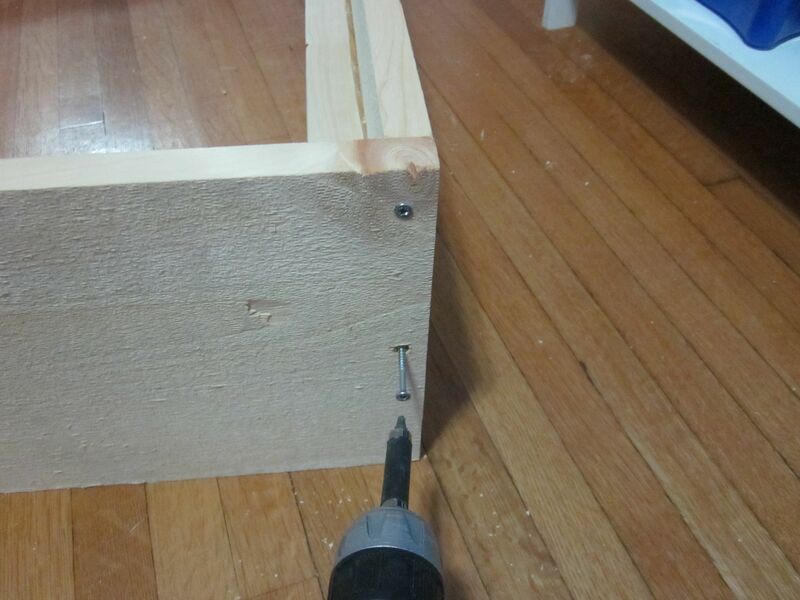 Staple the top edge, then turn the frame on its side to staple the bottom edges. Be sure to pull the fabric tight and place your staples very close together so that the upholstery doesn’t look bumpy. Now, the headboard. You can either sew a bit of a slipcover for it, or just wrap it and staple. I chose to sew a cover – I draped a piece of fabric over the headboard, pinned it where I wanted the seams to be, sewed it, and then put it on. 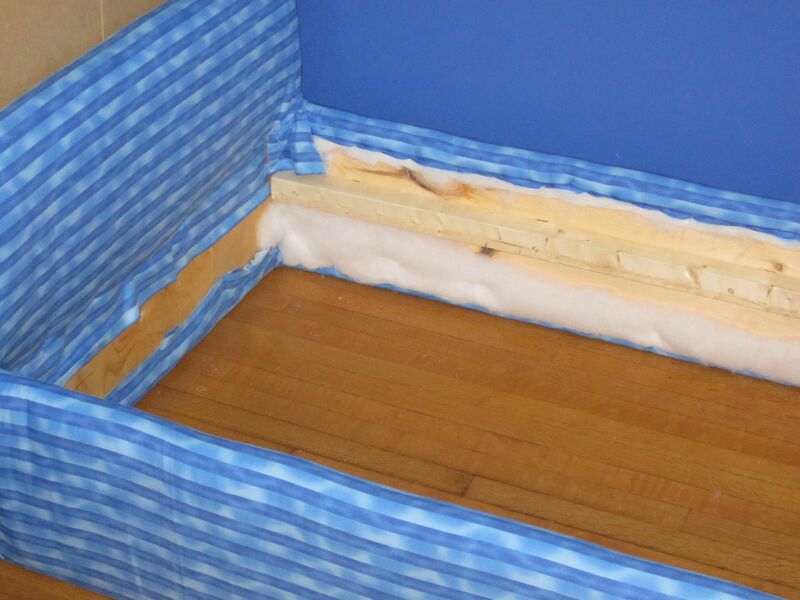 Staple the ends on the front below the level of the 2 x 2 furring strips, pull tight down the back, and staple to the inside bottom edge of the headboard. The ends where the headboard meets the side rails are tricky. I still haven’t figured out how to do it perfectly, so I’m no help to you here. Do your best. When in doubt, staple everything at the back of the headboard. 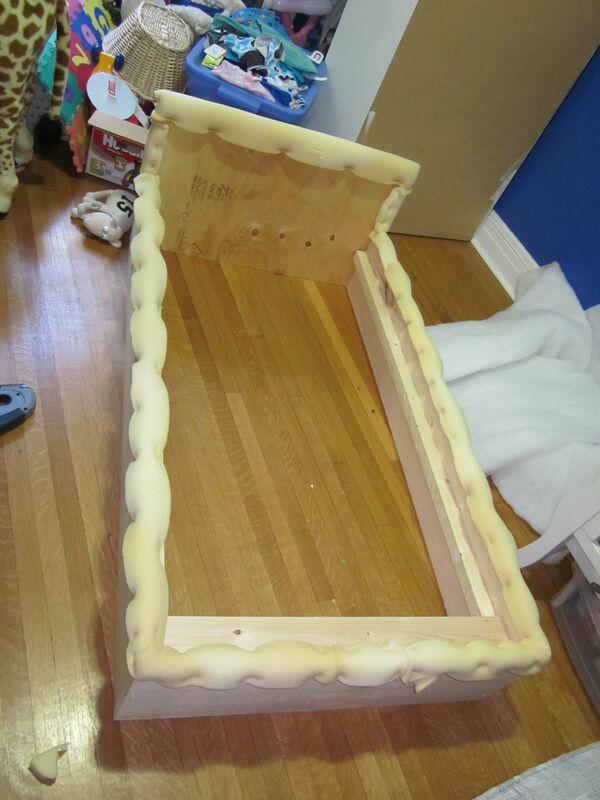 Take the 9 pieces of 1 x 4″ furring strips, and lay them across the bed so that the ends are resting on the 2 x 2 rails. Spread them out evenly. Love it! I’m pining it so I can find this later! wow, you’re so handy, I’m still jealous even with the tutorial! thanks so much for sharing on Craft Schooling Sunday! This is great! Thanks for the details on the tutorial!